Since New York is one of the most energy consuming cities in the US, it is not a surprise that the government wants to keep track of consumption patterns of large buildings.The Environmental Protection Agency (EPA) and Mayor Bloomberg started a project in 2009 known as Greener, Greater Buildings Plan to keep a public record of water and energy consumptions of large existing buildings in the NY. This allowed measuring the amount of Greenhouse Gas emissions produced in the country, which is then used to develop or modify policies inside the US that fight climate change. As part of a pack of laws, Local Law 84 benchmarking tracks water and energy consumptions of the largest consumers in the country by submitting a benchmarking report to the online tool called Portfolio Manager from EPA. Who Needs To Comply With Local Law 84? All buildings that exceed the 50,000 gross square feet must comply with LL84. Moreover, those buildings that share the same tax lot and sum up over 100,000 gross square feet must also comply with LL84. A public list is available to determine if your property must deliver this report in the Portfolio Manager or not. 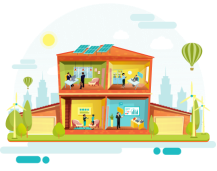 Buildings that share the same energy meter may be placed as a single entity, and those who share independent energy meters, heating, cooling, and hot water systems must be submitted separately. Who Can Do The Benchmarking? LL84 allows you to choose your benchmarking administrator. It can be office staff, the property manager, or a specialized energy consultant. It is recommended that if you are not familiar with the Portfolio Manager tool or the techniques required to perform the building energy benchmarking, that you go to an energy consultant that can develop the complete study accurately. When Do I Need To Submit The Benchmarking Report? Local Law 84 requires you to submit the report every year before May 1. Failing to do so will imply a violation that will result a penalty of $500. May 31: Last day to submit benchmarking data without penalty. August 1st: Last day to submit benchmarking data without second penalty. November 1st: Last day to submit benchmarking data without third penalty. February 1st: Last day to submit benchmarking data without fourth penalty. Failing to submit each new deadline will imply a penalty between $500 and $2000 in a year. Only the first deadline does not have penalties. How Is My Energy And Water Consumption Measured? Another score that is often used to do the building energy benchmarking is the Energy Use Intensity (EUI). You must keep a record of your scores in the last 3 years at least. If your Energy Star Score drop or your EUI increased, then you will need to do some upgrades to your building. How To Do A Local Law 84 Benchmarking Report? The first thing that your benchmarking administrator will ask you, will be data collection of your energy and water consumption. Your water consumption does not need to be collected by you because the NYC Department of Environmental Protection uploads this data directly to the Portfolio Manager. Therefore, your administrator only needs to upload the water data to the online tool. The administrator will also request access to the property’s energy uses with a breakdown according to the space type. You must provide the building gross square area that could be measured from an architectural drawing. Be aware that your administrator must verify that the square area of your building registered by the NYC Department of Finance (DoF) is the same as your effective square meter area. If the DoF value is lower, then your energy consumptions will be greater than they should and your score will be low. The benchmarking administrator will also need the building energy use of the last calendar year, including electricity, natural gas, district steam, oil, fuel, and any other energy source. Additionally, the administrator will require information regarding the types of operations that take place inside the building, data such as the number of workers, number of electrical loads connected (personal computers, microwaves, fridges, A/C, etc. ), and the number of hours worked per day, will be useful to make an accurate report. For further information go to the NYC Green Buildings & Energy Efficiency website. What Preparations Should I Be Doing Before May 1st? After February 1st, request to your local utility the energy use data from the last year. Check before April 15th that your benchmarking administrator entered all the meter data from January 1st to December 31st. Also verify that your EUI score is less than 1,000 kBTU/psf and that is above 5kBTu/psf, outside of this ranges it wouldn’t make sense. Make sure to verify that your BIN (identification of the building) number is entered correctly. What Should I Keep Record Of When The Benchmarking Report Is Submitted? To understand all the steps and technical requirements to effectively submit this report in time to save you money, ask for a detailed explanation from an experienced energy supply company such as the Phoenix Energy Group which gives free consultations on the topic. The Phoenix Energy Group as a promoter of high energy efficiency and renewable energy sources can help you answer your questions and comply with other local laws such as LL87. Ask for energy planning and the steps to comply with LL84 as soon as possible.